The New York City Bar Association, through the work of its Drugs & the Law Committee, supports the creation of a system for the production, distribution and adult non-medical use of marijuana in New York State. The Drugs & the Law Committee was formed in 1986 to research and analyze why the criminalization of drug use, manufacture, and distribution had neither solved nor ameliorated the problems associated with the manufacture, distribution, possession and use of drugs. 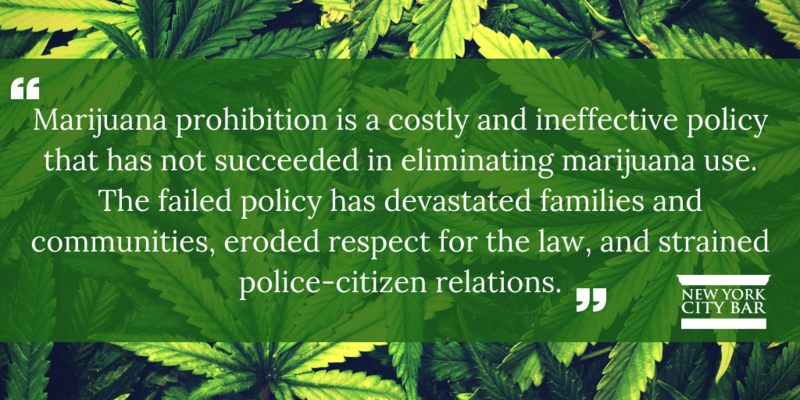 In the intervening 32 years, the Committee has extensively studied U.S. drug policy, consistently finding that the societal costs of drug prohibition are too high to justify. After significant study, the City Bar has endorsed the Marihuana Regulation and Taxation Act (“MRTA”), sponsored by Senator Krueger and Assemblymember People-Stokes (A.3506-B/S.3040-B), as a model for how New York could adopt a marijuana regulatory scheme. This dedicated section highlights our efforts to issue reports, conduct programs, advocate legislation and otherwise work toward implementing a regulatory scheme for the adult recreational use of marijuana in New York State. It is intended to be a resource to educate our members and the public about an important policy issue facing New York. To view materials, click on the left side menu: "Reports" for related City Bar reports; "News" for related press releases, blog posts and media coverage; "Events" for upcoming events; "Resources" for past event recaps/audio and related bill and hearing information; and "Of Interest" for relevant studies, data and outside organizations working on this issue. Springtime for Cannabis: 75 Years After the LaGuardia Committee Report, What’s Next for New York?